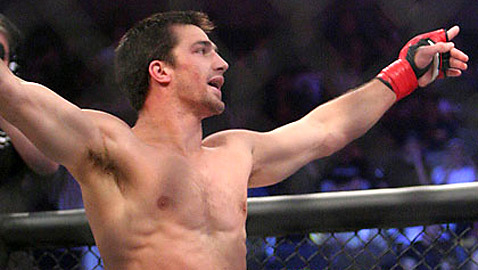 Luke Rockhold was the former Strikeforce champion, who stumbled in his UFC debut against Vitor Belfort. Costas Philippou was rocketing up the UFC middleweight ranks, on the brink of a title shot, before he fell to fellow rising star Francis Carmont. One of them had to get back on track with a stellar performance at UFC Fight Night 35 on Wednesday night at The Gwinnett Center in Duluth, Ga.
And it was Rockhold that did just that. After a couple minutes of doing the “where’s this going” dance, Rockhold landing a right hand and Philippou answering, the former Strikeforce champ went to work, and once he did, it didn’t take long to bring things to a conclusion. Rockhold twice went up high with kicks, opening a cut around Philippou’s right eye. As the New Yorker was preoccupied with the blood dripping into his eye, Rockhold unleashed successive body kicks that quickly sent Philippou crumpling to the mat. “I love that liver kick. It’s always there. You gotta set it up, go high, go low,” said Rockhold after the fight. And after finally put his first UFC victory on the books, Rockhold would like to erase the memory of stumbling out of the gate and get another shot at Belfort. “I’m not here to be good; I’m here to be great. I want my rematch with Vitor. I would like it here in the States,” he stated, although with Belfort already promised the next crack at Chris Weidman’s UFC middleweight championship, Rockhold knows he’s going to have to take another fight first.